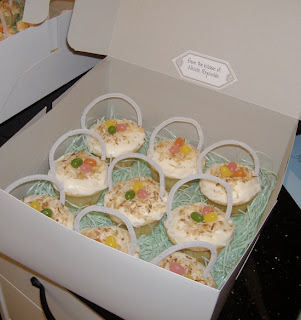 Here's a picture of the cute Easter cupcakes I made this week - they were yummy but most all of them ended up going over to the hospital with Jason. I actually love that people know Dr. Reynolds' wife as the one who loves to bake! I have always loved the kitchen but it's especially fun when I have a place to send all of my homemade treats. Jason and I will be at home for Easter. We are really excited to celebrate resurrection Sunday in our new city, in our new home, with our new little family. We have much to be thankful for and will enjoy the celebration of new life that Easter brings. Your cupcakes are adorable. And isn't it great being in a place where people only know you as Mrs. Reynolds?